Last year, when the Barred Rocks and the Araucanas were at the peak of their form, with not a boyfriend in sight, the Rocks used to run up to us at mash time, whirl around and squat. We were green enough in chicken matters to say, "oh, cute, they want to be petted," and pat them on the head, and then they would run off, puzzled by our reticence -- or their own behavior, for which they had little reference. Sylvester, the gander, was lord of all the poultry yard, king, duke, earl, count, and squire, and made constant hay with his harem, which consisted of one goose, Susannah, his Number One, and nine Khaki Campbell ducks (!! ), all of whom were willing enough to be seized by the neck, jammed into the bottom of the pool, and "sat" upon on a regular basis. The chickens were witnesses of, but not party to, all these public goings-on, and went about their own much tamer daily routine, depositing eggs, eating, drinking, snapping at flies, borrowing cups of sugar, playing bridge, and offering themselves regularly to the humans, neither of whom was any kind of a rooster but were at least alpha hens of some sort. We were big, we brought mash, might as well stay on our good side, no? From time to time, they would have a go at one another -- that is to say, the alpha hens would have a go at those lower in the pecking order -- and while it did not appear to us that they found this a very satisfactory solution, at least there was some sense among them that some activities are appropriate to adults, whatever those might be. A neighbor, meanwhile, received the gift of a spare rooster, and, not being willing to go through the labor of getting him onto the dinner table, she brought him over to the fence for our inspection. "S'free. Y'wannim,'ll throw 'm over." He did look rather docile, so we agreed, and without ceremony Chanticleer was launched on the longest flight of his career. An extraordinarily handsome Buckeye of very large proportions, Chanticleer towered over his flock, who one and all fled in terror at his advent among them. He, not having been an alpha rooster in his previous incarnation, also fled in abject terror from them. Everyone cowered in their respective corners for a day or two, while the geese and ducks marched contentedly up and down, gabbling of slug dinner vs. snail dinner, with dandelion tea. Come mash time on the third day, Chanticleer and several Barred Rocks approached the treat from opposite directions and arrived all together. The ladies looked up at Mr. C. appraisingly, and one of them whipped around right in front of him and squatted. "Ahh," we said to ourselves. "So that's what that was all about." Several seconds of stunned silence followed. Chanticleer seemed to be thinking things over deep in the lizard layer of his brain: "Hen directly ahead. No alpha rooster in sight. Haven't seen one in days, in fact. Might not get the dee-whattly beat out of me if I take a closer look." He stepped forward, tentatively, but couldn't quite make out, or make, his next move. She squatted a little deeper in the straw and waggled a bit. "Oh ... ... ... YEAH!" The deed was over in about six seconds, which seemed to us a pity, given the sea of hormones the barnyard was awash in, but the Rock, after the first startled squawk, appeared to be, on the whole, pleased with herself, and all the other young hens sidled up to ask: "so, uh, what was it like?" Over time, Chanticleer proved himself the best kind of rooster, from any self-respecting hen's point of view: a gentleman. He would lead his flock, as if following Sylvester's example, all across the pasture, keeping a weather eye out for hawks and foxes, while also finding the choicest bugs to scratch up, step back and offer, almost with a courtly bow, to his ladies, one by one. You could practically hear his spiel: "My Dearest Dear: As I'm Sure You Know, I, The Lord Of All I Survey (that gigantic fool of a gander excepted), Have The Sole Right To This, And Any Other Beetle I Uncover. However" -- nodding conspiratorially toward her -- "This One I Offer To You, My One True Love Now And Forever." And she would step forward and accept the dainty. And then Mr. C. would sashay along to the next biddy, scratch again, and smoothly take it from the top: "My Dearest Dear ..."
This spring there began to be trouble in paradise. Despite our best efforts in providing plenty of clean pasture, a variety of vegetables and greens, ground oyster shell, shady and private nesting boxes and clean, plentiful bedding straw, eggs began to be eaten, first by ones, then by twos, and ultimately almost every egg in sight, duck and chicken alike. Goose eggs being a bit tough mostly got a bye, but our dozen-egg-selling days were over until we could come up with a solution. We suspected the Araucanas, who had taken over Mr. C. (though he was not at all faithful to them), and begun to swagger about and chase the Barred Rocks from feed trough, laundromat, and mash alike. The early egg-smashing consisted almost entirely of Barred Rock brown eggs, which seemed suspicious to say the least, and though we were on the watch, we couldn't catch anyone in the act. Internet research did not turn up any strategies that seemed to work at all for us. We tried isolating the sub-flocks, but this appeared to make everyone miserable, and by this time the green eggs were fair game as well -- all and sundry had developed a hankering for albumin, apparently. Brown, green, duck -- whatever. It's all right there on the menu, and free, free, free. 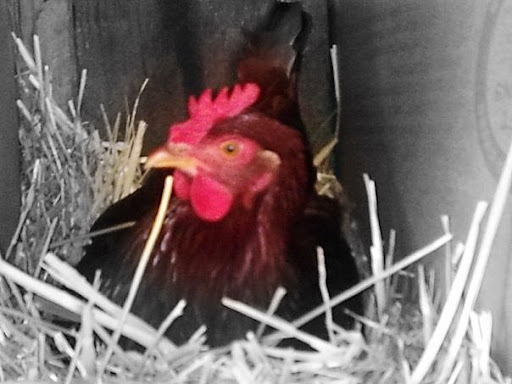 Sadly, we concluded to start over, and bought in a clutch of tiny Rhode Island Red chicks. We would move all the Araucaunas and Barred Rocks to the freezer, one by one, and then introduce the Reds to the Lord of the Barnyard. Our timing was not perfect. Chanticleer ran out of harem before the Reds were quite ready for him. A rowdy and self-sufficient gang of street pre-teens one and all, they hit the ground running, passing cigarettes and purloined credit cards among themselves and admiring one another's tats. They gave Mr. C. a wide berth, and for about three weeks (three eternities in any rooster's limited calendar) he couldn't get anywhere near them. The poor dude was stranded in a sea of sassy, lightning-fast henlets. What's with all the predator-watch, old-timer? We can outrun 'em, and we can outrun you, too! They laughed. His magnificent tail feathers drooped, and the kingly pride faded from his eye. Meanwhile, unbeknownst to Mister, a few pullet eggs were showing up in the henhouse. Uneaten! And the Reds were filling out and slowing down a little, talking shyly among themselves of perambulators and pink and blue pajamas. Feeling quite sorry for him one day, as I was nibbling a sandwich in my own corner of the barnyard, I twisted off a crust of my best homemade bread and offered it to him. Gently, even daintily, he accepted the gift, then stood, craning his neck left and right, rolling each eye forward, as if trying to examine the morsel without setting it down. The tiny light bulb came on. Chanticleer trotted with the bread crumb over to the nearest Red (who was already putting on her running shoes and grabbing her cell phone, just in case he might try any funny stuff) and laid out the prize before her unbelieving eyes. Stretching himself to his manliest height, and brandishing his gorgeous tail, he swept off his Musketeer's hat with the ostrich plume and bowed his deepest bow, the bright afternoon sun glinting from his epaulets, and from the basket-hilt of his gilded sword. "My Dearest Dear," he began. And she stopped to listen. ... there is the sun. I was at a conference, and was asked about my hearing. "Did you lose it all at once, or gradually?" Neither. I lost about half of my hearing all at once, when I was maybe eighteen months old. Then half of the remaining half, or all of the hearing in my left ear, during a catastrophic illness back in the nineties. I was explaining how that involved a strep infection, and my new friend said, "two decades ago, I lost a newborn to strep." That brought a halt to the conversation. Feeling for her, my eyes filled with tears, then hers did, then we just openly wept with our arms round each other's shoulders, as passersby milled around us. I told her about Benjamin. Beloved had a couple of very late-term miscarriages in about 1983, when we lived in an area that was being sprayed by the Forest Service with, in effect Agent Orange herbicide, the spray schedule of which was later shown to exactly correlate with steep increases in miscarriages among farm families and their livestock in our valley. There was, as was happening to others up and down the valley, a completely unexpected labor. -- which helped a lot, actually. I walked a very exhausted Beloved into the house, the one that we had built with our own hands, and put her to bed, and then brought in the little kidney-shaped plastic dish, with its green towel folded over the tiny, and very still, pink form. We uncovered Benjamin and sat with him between us on the bedcovers. He had all his fingers and toes, and his boy parts, and his eyes were closed. I covered him again and went out and buried him by the side of the front steps, near the little apple tree, and went to bed, as the sun rose and the mountain birds set up their nesting songs all round. One doesn't think about these things so much, and then someone says something, and -- boom -- there it all is again, and hurts about as much as it did the first time. And this morning Beloved and I talked about this, and we both think -- it helps to understand a hurt or a loss if you have had that same hurt or loss, or a close analogue. So that the best nurses, sometimes, are people who have been very sick (and recovered! ), and counselors who have been through a loss may make the best bereavement counselors, and teachers who struggled with math are sometimes the right people to teach remedial math, and so on. Last Son, who was conceived not long after we lost Benjamin, did make it into the world, but it seems likely that the contamination issues were still present. He had six serious birth defects, two of them life-threatening, and has to contend with Asperger's syndrome as well. He handles his circumstances with immense grace and dignity, and does not concern himself with the might-have-been. "I am who I am," he says. "I'm not less than someone else, just all of me. How is that different for anybody?" A strong team player, [he] works well in both large and small groups. He is able to remain relaxed and composed, lending a sense of stability and calm to situations of high intensity and commotion. He is at ease with the huge diversity of volunteers who come to the Garden. Having incredibly strong interpersonal skills, he is comfortable working with everyone from preschool and elementary aged children, to special needs adults, high school and college aged students and retirees. He treats everyone with the utmost compassion and respect. She notes particularly his rapport with those with "special needs." Many have acquired a sense of shame from the way others see or treat them -- as being something "less than" others. He teaches, by example, that there is no need to accept that burden. You want to handle a shovel? Here's how. These are weeds. Those aren't. The lettuces and fruit trees have their own clock, and all of us, however "slow," that wish to have a hand in this work will find that the garden has time for us. Having a quiet young man around who is about the garden and not about limitations is a real help. ... that's nice to know. I won't pretend raising him was easy, though. I'm glad I could relate to my friend's sorrow. One may wish that one hadn't had to acquire the qualifications through like pain, but there it is. Life is to be lived, and death is a part of it, and if corporate greed hadn't been a factor, perhaps something else might have. Being born with Aspergers sometimes builds character, just as lifelong deafness does. Another friend once said, "I'm not the Blind, I'm a person who experiences the world in specific ways, and sight doesn't happen to be one of them." It's nice when circumstances can be played as strengths. After the conference, a member of my organization checked on me. "Were you okay in there?" Whole wheat; whole spelt; rolled oats; rye; buckwheat; rolled wheat berries; fresh chopped bigleaf maple flowers, leeks, kale, chard, broccoli leaf, elephant garlic greens, "walking" onion greens, dandelion greens; 32 oz. of pot-liquor (water from steamed veggies); honey; agave nectar; sea salt; fresh free-run duck egg; home-dried Bing cherries; flax seeds; baker's yeast. Raise once in the bowl; cut, roll out and shape loaves, place in greased Pyrex or stoneware dishes, set in oven, raise to desired shape, bake at 325 for one hour. "So, see you next week." "But what if the ducklings come in while you're gone?" "They won't get here till Monday." We had our first couple of days of the year over sixty (F). In that time Risa did some barn repair, weeded, built fence, converted the creek bridge into a duck bridge (with hardware cloth "railings," to keep the ducks out of the creek), mowed, and spread grass clippings. While she was mowing the pasture, with the Annies doing much the same down at the other end, a dark cloud boiled across the landscape and began dumping small hail at what looked like a forty-five degree angle. Risa hid out in the Scriptorium, where she writes book chapters in better weather, and watched the ducks, who went right on about their business as if nothing were happening. The advantages of a down jacket and a hard skull! Goes well with the chicken soup.